In a world of cable news panels and never ending Tweet-threads, it’s maybe not so surprising that audiences responded big time to the movie that promises little to no dialogue. John Krasinski’s A Quiet Place is predicted to be the surprise winner at the box office this weekend. The thriller, about a family trying to survive after Earth is overrun by alien predators who hunt by sound, has already raked in $45 million. The film stars Krasinski and his wife Emily Blunt as parents trying to protect their children in a world where making any noise at all can get you killed. Just think how much work they must get done. The box office showing is even more impressive considering the movie only cost $17 million to make. It also had stiff competition including Steven Spielberg’s Ready Player One’s in its second weekend, and the opening of the comedy Blockers starring John Cena and Leslie Mann. 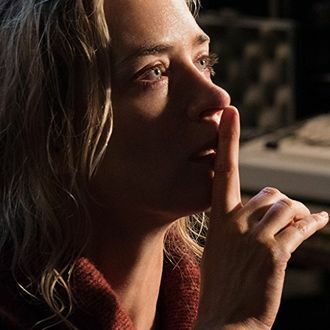 A Quiet Place debuted at SXSW and has received glowing reviews, not surprising for fans of The Office who already knew Krasinski to be a true master of silent, meaningful looks of panic.